I had a few questions about yesterday's post and thought a follow up was in order. 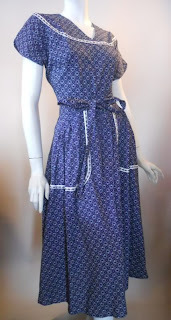 The Swirl dress is both a label and a style. Like any idea that catches on, copies are made and it was no different with Swirl. 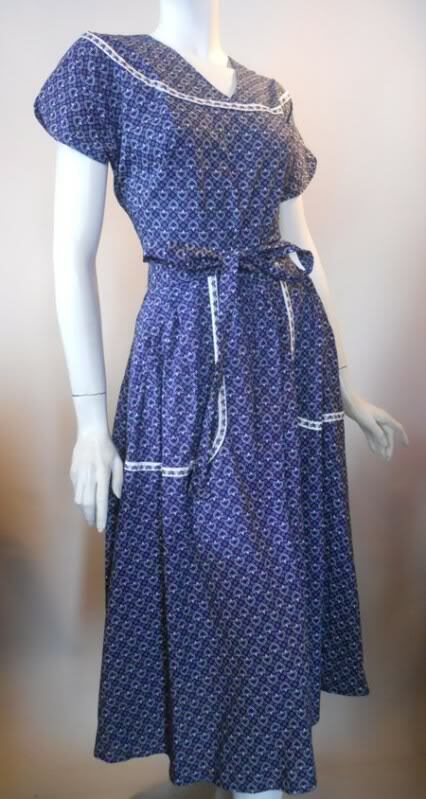 The basic defining factor that separates this type of wrap dress from another is how it wraps -- around the back instead of the front. See how the woman in the ad slips her arms into the front, buttons the back, and then brings the ties through to the front? That's what makes a Swirl (or a knock in this style) a Swirl. 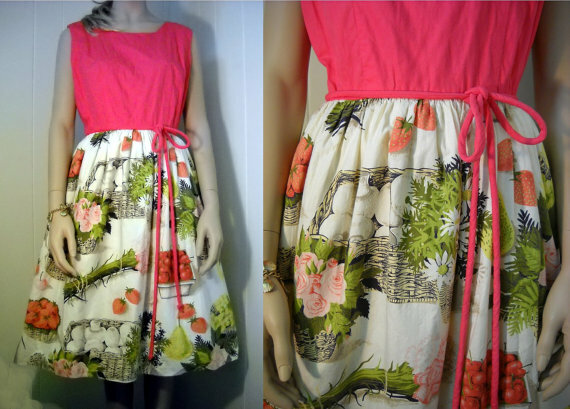 I have many dresses in my collection that are made by a different label, but are essentially Swirl dresses; they have the same cut and style, just a different label. 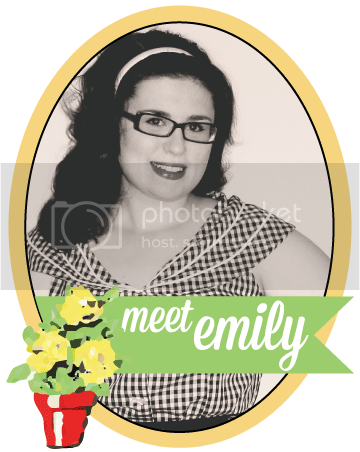 I have some that were even homemade, likely with some of the patterns I posted yesterday. So what distinguishes a Swirl from a knock off? 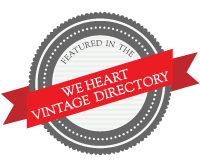 Other than the label, which you can see all of them HERE on the Vintage Fashion Guild's label guide, Swirl dresses have a trademark button, seen above. This is an easy way to spot a Swirl brand dress. 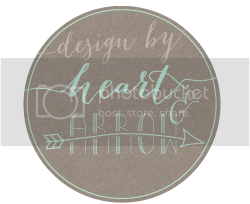 Now, not all of my Swirl brand dresses have this button (some might have been lost/replaced and I don't think the button was introduced until the 50s), but most of them do. The best way to date your Swirl is with the label guide posted above. 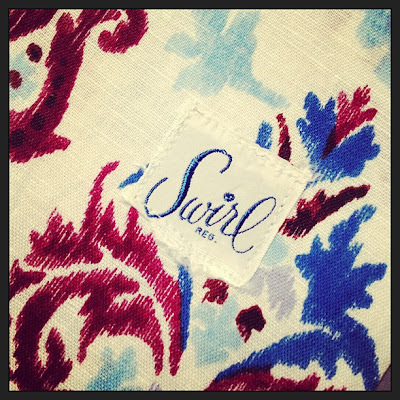 The Swirl label changed over the years and is a great way to help date your dress. Keep in mind that there are some known dresses from the 60s that have the 40s Neat 'n Tidy label in them. It is thought that an old box a labels were found and used rather than thrown out. 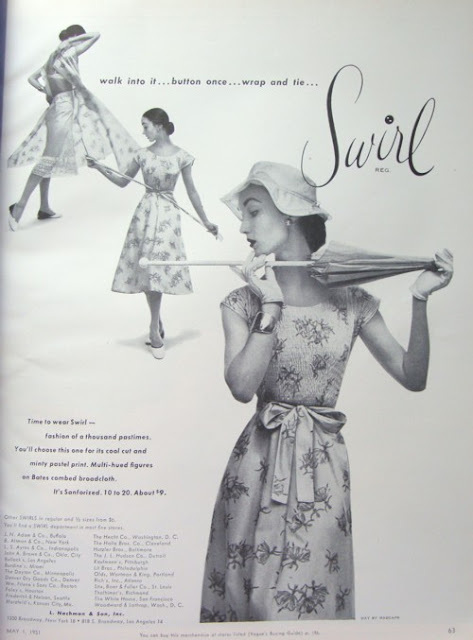 Later Swirls, those from the late 50s and all throughout the 60s have a shorter hem line. The earlier dresses will fall below your knee, while the later ones will fall just above your knee or at your knee. (earlier on left, later on right). Earlier Swirls (40s) will have side seam pockets, 50s Swirls will have two big patch pockets, and 60s Swirls normally have just one pocket, or smaller pockets. 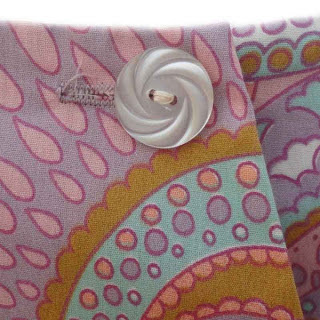 All pre 60s Swirls will have a sash tie made out of the fabric of the dress about an inch or two wide. 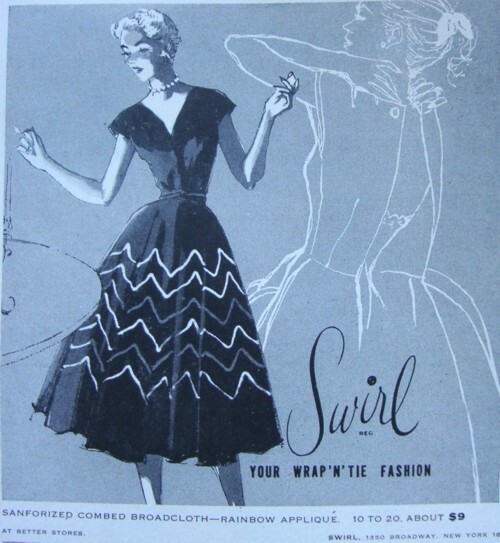 Many Swirls dating to the 60s have cord ties, often out of a solid color fabric. See dress below. Yellow and Pink colors seem to be popular for all eras of Swirls, but here's a few tips on what fabrics were used when. 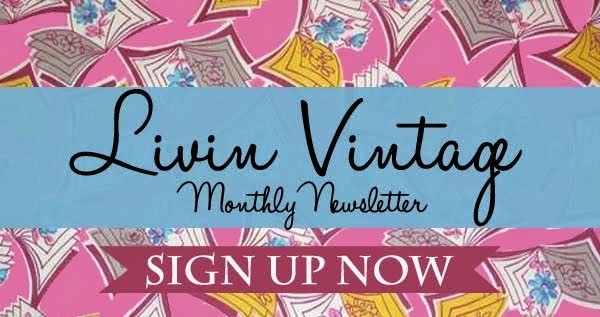 50s Swirls have feminine color schemes, while 60s Swirls have deeper/darker color tones. The 60s Swirls also have the two toned look, with a solid color top and patterned skirt (see above). Hope this helps answer your questions! 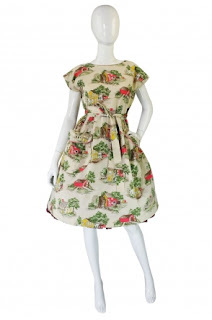 I need to do a post with photos of my Swirl dresses, I'm currently wearing a 1940s Swirl as I write this and I have several 1950s and 1960s dresses as well. Sadly I haven't come across one in several years! I am yet to find a proper swirl dress for myself.